Presenting is something that we all have to do at some time in our lives. Some people get anxious and nervous just thinking about it. However, presenting is nowhere near as difficult as many people think, especially if you've prepared thoroughly and have the right tools to hand. A powerful presentation begins with the right tools –and that means Legamaster presentation media. If the subject that you're talking about is a location, product or situation, then an image, video or graphic can significantly enhance your presentation. That way, you’ll also be able to clearly communicate a great deal of information in a short space of time. 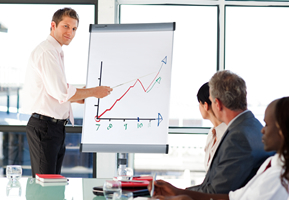 With the wide range of Legamaster whiteboards, pinboards, flipcharts and interactive solutions to choose from, you will have no problem emphasizing your spoken words with the help of visual aids. Use our products to transform information into an experience, turning meetings into success stories. We can provide a solution to suit every situation. Spoken words are not always heard. As a result, your audience might only hear part of the message you are trying to put across. The more your senses are stimulated, the better you will remember the words that you hear. That's why it’s vital to have a well-designed conference room, meeting room or office space if you want your meeting to be a success. Legamaster offers all the tools you need to turn any location into an effective presentation space. Want to find out more about Legamaster presentation products? Discover our wide range under ‘Products’ and find the presentation media you've been looking for. Got a question or need specific advice? Please contact us. We will be happy to help you choose the presentation tools that are right for you!